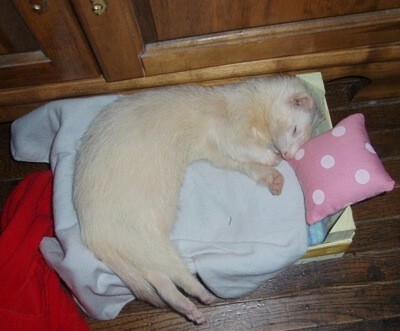 Scooter and Rascal are 7 year old Ferrets. Scooter was Adopted from a boy who could no longer keep him. 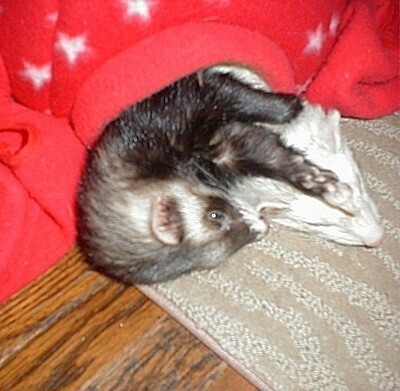 We have a little dark colored girl ferret named Rascal, who was purchased for my daughter. 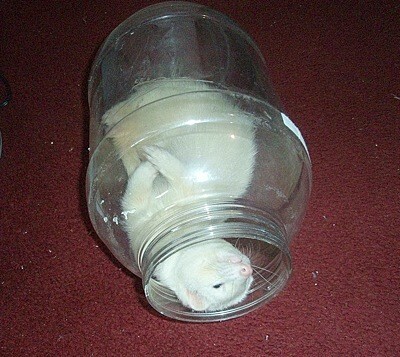 Ferrets are such adorable pets, smart and very amusing! Rascal used to be full of trouble (which is where she got her name) but is aging too quickly now, but still adorable! Scooter is her adopted brother. He is sleeping in a home made bed my daughter made for him out of an old tangerine crate. Scooter who is also a barrel of laughs and follows us around like a little dog, waiting at doors if someone leaves! Very cute pets to own! How precious! They are so darling!